4/5/2011 Laura Clement said: To this day this book still holds me when I find I am in a silent moment. Something that remains to present in one's life years and years after reading should be honored and revisted. Add your reply to Douglas E.
2/23/2010 Mary Sandford said: Great read. Worth reading again and again. 8/27/2009 Coriene Ploetz said: Whenever I wanted to escape real life, I found refuge in a good book. A Wrinkle in Time was often the book I turned to. The fantasy and adventure always took me away when I needed it most as a child. 2/5/2009 Jeannine Kantz said: I may have to read this again...I enjoyed all three thoroughly and keep them just so I can give them to my grandkids to read some day. 10/15/2008 Danielle Brewer said: One of the first books a really cherished - such strong characters. A Wrinkle in Time is a well-loved classic of children’s literature that has remained popular throughout several generations. It has the additional distinction of being a Banned Book. But it’s also a wonderful examination of a young girl’s changing relationship with her father, and of how both fathers and children need to change as children go through the process of growing up. 9/25/2008 celia Leary said: I loved this book as a child, and still love it as an adult! 7/5/2008 Andrea White said: I love Madeleine L'Engle! Her work is very interesting to middle school students! 6/24/2008 Jina Oravetz said: I loved this book! I was excited when they made a movie out of it but of course the book was better! I also got to see it done as a play, which was wonderful. This title is the first in a series of four amazing novels for young adults. Madeleine L'Engle has provided dynamic language and exciting imagery to encourage students to think beyond the here and now. Not just a work of science fiction, this novel is thought-provoking and reflecting for young men and women. 4/2/2008 Rahma Krambo said: When I first read this many moons ago, it was in a genre all by itself. It has a spiritual quality to it that was unique and I believe it still is. 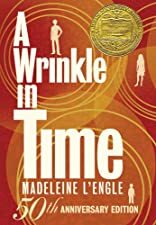 A Wrinkle in Time continues to be one of my all time favorites and Madeleine L'Engle is a major source of inspiration for me in writing. 3/28/2008 Kelly Sonnack said: One of my all-time favorites, and was a joy to revisit as an adult. 2/18/2008 Monette Pangan said: I love this book. I read it at least once a year and I make it a point to recommend it even to adults! 11/27/2007 Fran Slayton said: One of my all-time favorites. This book changed my life. It altered my understanding of time and love. How cool is that? Madeleine L'Engle has influenced my desire to write more than any other author. If my books can move a child's heart like hers moved mine, then I'll be one happy, happy girl. 10/16/2007 Stephenie Hovland said: I'm reading this to my class now. Chapter one is a great example of characterization. 9/21/2007 Leisl Adams said: One of my all time favourite books! 8/11/2007 Tracy Grand said: A fantastic book... I'm reading it again!